A collection of my most twisted and poisonous short stories. I grew up reading science fiction, fantasy, and mystery. My father loved science fiction, and enjoyed mysteries and good fantasy, so our house was full of the stuff. Not horror, though. Dad didn't like horror. Some of it crept in anyway, one way or another -- often because it was written by an author (Ray Bradbury, for example) who my parents considered a science fiction writer -- but that only amounted to perhaps a dozen or so of our thousands of books. I realized as a kid, though, that I liked horror, even if Dad didn't. And later on I realized that my mother loved horror, but hadn't been buying it because she didn't want to annoy my father and we had plenty of other stuff to read. So I checked horror stories out of the library, and bought horror comics (such as they were in the Comics Code Approved 1960s), and watched horror movies on TV when I could. Once I was old enough to drive I even saw a few of those movies in the theater. Well, actually, I had been thinking about it for a long time. I wrote my first horror story for a class assignment in fifth grade, lifting much of my plot from the Vincent Price movie "The House on Haunted Hill." But I only started thinking about writing horror professionally in the late 1980s, when I had already published a good bit of fantasy and science fiction. At the time horror was booming, particularly the subgenre known as "splatterpunk," so it seemed like a good idea to get in on it, and I tried, but alas, I was behind the curve. By the time my first horror novel, The Nightmare People, saw print, the boom had gone bust. But I had tasted blood, and all through the 1990s I wrote short horror stories for various markets. Around the turn of the century, though, I ran out of steam. My mood changed, and horror was less appealing. There weren't as many markets anymore, and due to health problems I wasn't writing much short fiction of any kind, so I pretty much stopped. I had unfinished stories lying around, and a complete but unsold story or two, but I had lost interest. They stayed unfinished and unsold. At that point I had been thinking for years that I should put together a collection of my short horror stories. I wanted to call it Toxic Stories. Then I started writing "Hazmat," and decided it should be Hazmat & Other Toxic Stories. 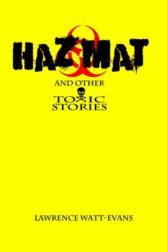 But I needed to finish "Hazmat" first, obviously, and... well, I'd stopped writing horror. So for the next fifteen or sixteen years, I never got around to finishing it. But finally, in March 2016, I did. Which meant I could assemble that collection. This is not all my short horror. I haven't included any stories that are in any of my other collections. That means no vampire stories, because I collected all those in In the Blood back in 2011. It means a few others, such as "Real Time," aren't here, since I'd included them elsewhere -- they fit neatly into other genres, in addition to horror. And there were a couple of stories that I decided just didn't deserve to be here, for one reason or another. These stories were not all written as straight-up horror; a few were even intended as humor. Still, they are among my most disturbing creations. They all have a definite dark side, even the funny ones.